Ever just need a little simple gift to give/exchange during the holidays? 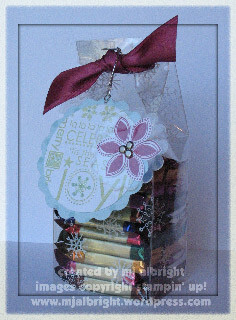 This clear transparent gift bag holding 10 chocolate squares is a hit! Great for teachers, co-workers, mailman, UPS, and a fellow stamper girl who live close by to me *wink*. I discovered this cute creation on Lauren Meader’s Blog… My Time, My Creations, My Stampendence. Click –> here to see her creation with the template. Needless to say, I ran out to the store the very next day to buy all items needed to make this. I stamped the Acetate with an assortment of SU! snowflakes in Stazon Opaque White ink (drying time is extremely quick). Used Scor-Pal to create all of the scoring lines. I used Sticky Strip to hold together (can hardly see). Filled with an assortment of 10 different chocolate squares. Punched two 3/16″ holes in the top and closed with Purely Pomegranate Satin Ribbon. I first stamped the sentiment with Certainly Celery ink on Whisper White CS. Used Coluzzle to cut out the circle. Next, used Coluzzle again to a piece of Soft Sky Prints DSP and used 3/16″ Corner Rounder Punch to create the scalloping (the scallops didn’t meet up perfectly, so the meeting place is hidden behind the poinsettia). I had to add Purely Pomegranate to the main image tag due to the ribbon, so added the flower. But I also wanted to incorporate more Acetate so I used my Scallop Punch & Acetate, sponged edges of the scalloped Acetate piece with Stazon Opaque White ink, and placed this piece over the poinsettia. Added 3 Silver Brads and adhered with a Stampin’ Dimensional. 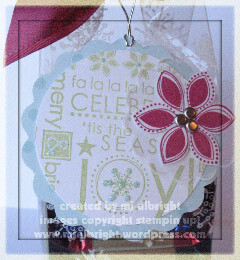 Added a touch of Baby Blue Stickles to some of the details of the stamped sentiment. Punched a 1/16″ circle to top and attached to Satin Ribbon with Silver Elastic Cord. STAMP SETS USED: Season of Joy; snowflakes from sets Snow Flurries, Simple Snowman, and Seasonal Whimsy. CARDSTOCK USED: Whisper White and Soft Sky Prints DSP. INKS USED: Certainly Celery & Purely Pomegranate Classic Stampin’ Pads; Stazon Opaque White ink. ACCESSORIES USED: Acetate sheet measuring 8-1/2″ x 9-1/2″; Scallop Punch; Crop-A-Dile for 3/16″ Circle Punch; 1/16″ Circle Punch; Coluzzle Cutting System; Baby Blue Stickles; Stampin’ Dimensionals; Silver Brads; Silver Elastic Cord; Purely Pomegranate Satin Ribbon. That’s it! Very easy. Thanks to Lauren for the inspiration. I love that you put the pointsettia over the uneven scallops, I think it looks Awesome! Cute!!! I like how you did the acetate over the flower!! I’ll have to get you to show me how to use the punch to do this. I’ve had no luck when I try to scallop with the corner rounder!!! LOVE this one too! It’s a great color combo, and the chocolate just puts it over the top, of course! I sure hope you consider Texas close by to you! *wink* lol! To cute. Who wouldn’t like chocolate. Thank you so much for sharing your wonderful ideas with us. Oh my! This is truly stunning. I want to make one too!! !